Democrats on Tuesday took total control of the Colorado government. Democratic victories on the state level Tuesday night broke unchallenged Republican power in many states while giving Democrats total control of government in some states that had a divided legislature headed into the midterm elections. Democratic gains in previously Republican-dominated states mean Democrats will have a bigger say in redistricting maps, which Republicans have used in an attempt to solidify their majorities without getting the majority of votes in recent elections. Ending complete GOP control in many states will create a barrier to abortion restrictions, voter suppression laws, and deep cuts to government assistance programs that have sailed through Republican-controlled legislatures since 2010, a GOP wave election year. Democrats’ state-level successes were the result of a coordinated campaign to challenge historic GOP power in governorships and state legislatures: Democrats ran more than 5,300 candidates in the 2018 midterms, the most for state legislatures since 1982, according to the Democratic Legislative Campaign Committee (DLCC). Three hundred and fifty state-level seats went from red to blue this election cycle, as of Wednesday, according to the DLCC. Republicans on Tuesday lost their state senate majority in New York, as Democrats removed what seemed to be an intractable impediment to a range of progressive bills, including the Reproductive Health Act. Gov. Andrew Cuomo (D), who won re-election in a landslide, could soon see progressive measures come to his desk now that state senate Republicans and their conservative Democratic allies have lost their hold. The Reproductive Health Act, which would codify Roe v. Wade into state law and shift New York’s abortion laws from the criminal code to the Public Health Law, passed easily through the Democratic-held New York house but died in the state senate. Democratic success in flipping the Maine state senate and taking the governorship on Tuesday could soon bring change for the 70,000 people in the state who have been denied access to Medicaid by term-limited Gov. Paul LePage (R). LePage has refused to follow the law and implement Medicaid expansion under the Affordable Care Act after voters approved a measure to do so last November. Democrat Janet Mills, who won the governor’s seat handily on Tuesday, has pledged to see Medicaid expansion through. Maine Democrats now have control of the entire state government, as they had already held a hefty state house majority. Republicans in Colorado couldn’t hang on to their last sliver of government control, losing the state senate as Democrats also retained the governor’s seat. GOP lawmakers will now have little recourse against Democratic efforts to expand reproductive health-care access in the state. U.S. Rep. Jared Polis (D-CO) on Tuesday defeated Colorado Treasurer Walker Stapleton to become the first openly gay governor-elect in the United States. Polis, who largely self-funded his campaign, maintained a comfortable lead in the weeks leading up to the election. 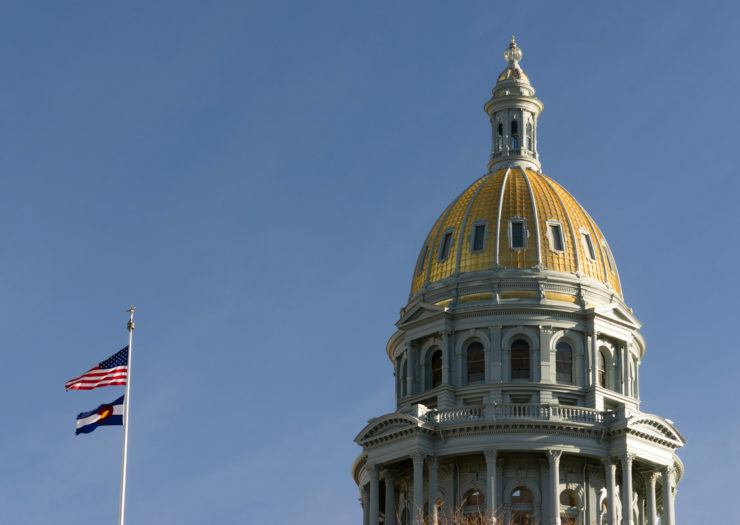 To flip the Colorado state senate, Democrats needed to hold three Democratic seats and oust at least one Republican in two key suburban districts surrounding Denver. They won all three districts. Among the losers was state Sen. Tim Neville, a Republican who was a leader of the anti-choice movement in Colorado. With Democrats flipping the Colorado treasurer, secretary of state, and attorney general offices, U.S. Sen. Cory Gardner (R-CO) and University of Colorado Regent Heidi Ganahl are the last remaining Republicans holding statewide offices in Colorado. New Hampshire Democrats took control of the state’s house and senate, removing some GOP roadblocks to strengthening reproductive rights, paid leave, and Medicaid. Republican Gov. Chris Sununu, who won re-election against Democrat Molly Kelly, will now face an oppositional legislature. DLCC poured more than $900,000 into wresting the New Hampshire legislature from Republicans. State senate Democrats campaigned on increasing the minimum wage, investing in public and higher education, and creating a paid family and medical leave insurance program. These could be top priorities for Democrats, Zandra Rice Hawkins, executive director of the Granite State Progress Education Fund, told Rewire.News. Sununu, meanwhile, is fiercely opposed to paid family leave benefits. Health care in New Hampshire is a looming concern. “In the coming legislative session the senate will need to address how New Hampshire structures newly authorized association health plans, which many health care advocates worry will not include the same consumer protections established in the Affordable Care Act,” she said, referring to the Trump administration’s “junk” health-care plans that that offer little coverage and have drawn support from congressional Republicans. The conservative makeup on the U.S. Supreme Court and the potential threat to reproductive rights at the federal level have pro-choice advocates discussing what can be done at the state level to strengthen abortion rights. Democratic majorities provide some hope that abortion rights can be protected in New Hampshire. “New Hampshire has long enjoyed strong bipartisan support for reproductive rights, but this new landscape will require many elected officials to put that support to the test and we are pleased that so many candidates have made it a point to discuss their support for reproductive rights on the campaign trail,” Rice Hawkins said on the eve of the midterm elections. Democratic candidates in Pennsylvania as of Wednesday afternoon had picked up enough state senate seats to end the GOP’s supermajority, according to the DLCC. There could be recounts in two tight Pennsylvania state senate contests. Democrats chipped away at state Republicans’ massive house majority by winning 11 seats in the lower chamber. Gov. Tom Wolf (D), who has been a backstop against extreme GOP anti-choice measures in Pennsylvania, won a second term on Tuesday. North Carolina Republicans, who tried to eviscerate executive powers after Democrat Roy Cooper won in 2016, saw their supermajorities shattered on Tuesday, ending eight years of GOP legislators running roughshod over Democrats while eschewing longstanding democratic norms. The GOP state senate majority has been cut to 29-21 after Democratic candidates flipped five seats in the chamber. Democrats will likely trim the GOP majority in the North Carolina house to 66-54. The slate of Democratic candidates on Tuesday was almost half women, according to the DLCC. Without a supermajority that can overturn Cooper’s vetoes, North Carolina GOP lawmakers will have a far more difficult time passing anti-choice and anti-trans legislation that drew national attention to the state in recent years. Republicans will now be unable to jam through voter restrictions and gerrymandered legislative maps without the governorship and supermajorities. North Carolina’s GOP lawmakers weren’t the only ones to lose their supermajority on Tuesday. Michigan Republicans’ state senate supermajority came to an end as Democrats managed to gain three seats in the midterms. Governor-elect Gretchen Whitmer (D) will be able to operate without the threat of a veto-proof GOP majority. Republicans now have a 22-17 majority in the Michigan state senate. They also control the house. Michigan Republicans in September curiously approved paid sick leave and a minimum wage increase, opening the possibility that they could undermine the popular laws. That might not be as easy without a supermajority and with Whitmer in the governor’s mansion. The five state senate seats flipped this cycle is the highest number of Democratic seat pickups in Michigan since 1974, according to DLCC. Minnesota Democrats on Tuesday made gains in the state house, picking up 18 seats while maintaining control of the governorship. Republicans maintained control of the state senate. The DLCC spent more than $800,000 in Minnesota to create the Democratic state house majority in a state that President Trump narrowly lost in 2016. Tuesday’s election broke the 18-18 tie in the 36-seat state senate, with Democrats taking a supermajority in the chamber. Connecticut Democrats gained a 92-to-59 majority in the house, according to the unofficial count in the Hartford Courant. Democrat Ned Lamont beat Republican Bob Stefanowski by more than 24,000 votes to be the next governor. Anti-Trump sentiment helped unseat three Republicans—state Sens. Toni Boucher, Michael McLachlan, and Len Suzio. But Republicans held onto the seat vacated by lieutenant governor candidate Joe Markley in the conservative 16th Senate District that was won by Rob Sampson, chairman of the legislature’s Conservative Caucus. Progressive Connecticut lawmakers broke new ground this May to establish rights of incarcerated women and transgender people. With these Democratic wins, Connecticut could go further to expand, for example, Hartford’s progressive ordinance to prevent deceptive advertising practices at anti-choice pregnancy centers across the state.